This couple introduced their guests to the whole new world of #planetrara through their 5-day long wedding celebrations. 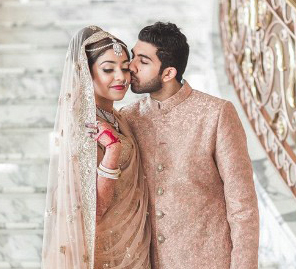 An engagement in a floral fairytale carriage, a baraat in a Batmobile with Batman as the chauffeur and indoor pheras with beach vibes - Mira and Ravine’s wedding in Bangkok had all of this and more! 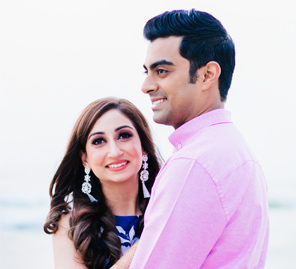 Planned by WeddingSutra Favorite Pink Palki and photographed by WeddingSutra favorite DotDusk Studios and Ali Ghorbani, their wedding was one that will forever be etched in the hearts of their loved ones. Mira and Ravine met in New York - half a world away from their home in Hong Kong. Bonding over pizza, their love story wasn’t filled with drama and adventure but one that grew steadily into a flourishing relationship. After looking at venues world over, the couple and their families landed in Thailand and fell in love with Bangkok. This lively city made for the ideal location to exchange their vows and begin their journey of love and togetherness. Mira and Ravine’s wedding was an elaborate affair for which nothing but the best would do. With Pink Palki by their side, the duo was able to create an unforgettable experience for all their wedding guests. In order to ensure that all their special moments were preserved in timeless frames, the duo got on board DotDusk Studios. Along with this team, Ali Ghorbani captured some beautiful photographs of the lovely couple on their big day. The entrance to their venue was a story book – one half serving as an actual doorway into the revelries, the other a page with a little bit about the couple’s love story. As the guests walked in they were privy to a charming stage designed to look like a carriage smothered in white flowers. When they exchanged vows, their nieces played ring bearers and came to them in a mini Lamborghini and Ferrari! Mira wore a red velvet Manish Malhotra gown and antique belt. Ravine wore a D-Squared ensemble and Zanotti loafers. At their Janya ceremony, the ceiling was decorated with drapes and large silver bells. The canopy where the ceremony took place featured white flowers on the stairs and the roof. The bride says, “Ravine and his little brother Pravin are 12 years apart, yet these best friends couldn’t have more in common. Their shared love for each other and basketball is infinite”. The entire Mahtani family wore Cherie D ensembles in gold and Mira wore a Tarun Tahiliani runway couture piece for this function. Ravine is the owner and founder of his own sneaker company Sneaker Surge and so the guests were in for a treat. An unforgettable sneaker party titled ‘Let’s Get Lit’ was planned where every single guest received a pair of light up sneakers. Their entrance was preceded by a video and their parents arriving at the venue wearing jackets that read RaRa. After this remarkable prelude, they entered through a dance that they performed alongside their friends. The decor was executed by Kun Pom, owner of Design by PeeraPach, and styled by Mashu Hemnani owner of Sarasa. The entrance looked like Brooklyn Bridge and all the walls were decorated with the New York City skyline. The dress code for this event was Couture & Kicks. Inspired by Kim Kardashian and her make-up artist Natasha Moor, Mira chose a pin straight hair look with a gold and black Cherie D dress. Mira’s love for quaint afternoons with her girls, Parisian cafes and all things beautiful was recreated at her mehndi. Being in a city, they had limited outdoor spaces, but as they say, where there is a will, there is a way. They built a beautiful mandap over the pool where Mira sat. While the floor of the setup was covered in grass and large butterfly cutouts hung from the ceiling, the pool was surrounded by floral umbrellas. Performances took place by both the family members and by the Shiamak Davar Dance Company. Mira was dressed in a pastel grey Manish Malhotra one-shoulder gown with floral embroidery, perfect for the afternoon. Ravine used the colors of Mira’s flowers to create a Nehru jacket by Just Men. Their sangeet was an unforgettable night of glamour, extravagance and non-stop dancing. Performances by friends and family resonated with love and excitement. While everyone performed beautifully, it was the groom who stole the show with his LED dance which received a standing ovation. The Meet Brothers kept the crowd on their feet, the food never stopped coming, and drinks were served on a raised, 15 feet wide bar that resembled a piano. A royal blue velvet lehenga from Sabyasachi made for Mira’s sangeet outfit and Ravine wore a matching sherwani. Ravine’s unique baraat was an ode to his childhood. Ravine’s father was in the toy business and so his room was filled with the newest Marvel and DC superheroes. It followed through that no one less than Batman would drive him to his pheras, in a Batmobile. Rapper Shah Rule created a custom theme song for Ravine and Mira’s baraat and all the guests were asked to dress in yellow t-shirts, capes, and safas. While he had his way at the baraat, the pheras were all about Mira. When she told her father-in-law she wanted to get married on a beach he made sure that nothing else would do. Though the hotel was not a beach property, he ensured the entire ballroom had a 360 LED projection of the ocean! To add to the splendor, the garlands were brought in by the dance group MJ5. Both Mira and Ravine wore traditional outfits in a lighter color palette. Mira wore an ivory Sabyasachi lehenga, which she matched with polka earrings by Sabyasachi and a 5 row set with emerald drops. Ravine wore a beige sherwani embellished with gold sequins by Manish Malhotra. 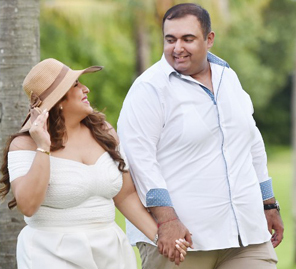 At the grand finale of the 5-day long celebration, the couple’s guests were whisked away to a mystical rainforest, with swings, animals and a beautiful waterfall. Family and friends gave heartfelt speeches, leaving not just the bride and groom but the whole ballroom in tears. The couple performed their first dance to the song Halo that was sung by the groom’s sister while a home video of the couple played in the background. The MJ-5 dancers also amazed the crowd with their performance that included a flaming motorcycle after which their wedding video was screened for their guests. The bride and groom both wore Manish Malhotra runway couture pieces. The bride was in an ivory lehenga with silver and gold thread work, a pearl embroidered bustier top that included sheer floor-length sleeves. The groom wore a black tuxedo with gold floral embroidery and a matching Manish Malhotra bowtie. 1. Make sure your wedding reflects your personality. 2. When choosing outfits, pick what you love and feel confident in. Once you’re confident – you carry yourself with grace. 3. Work as a team and don’t be afraid to take risks because nothing is impossible. Who would have thought having a mobile baraat on the most crowded street in Bangkok with Batman would ever be possible?